Short update, more to follow. 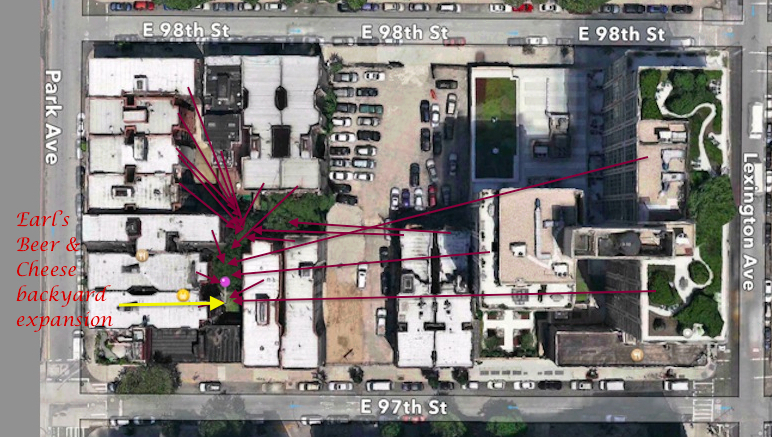 Red arrows are all buildings with air-sound access to the proposed backyard beer joint. Towards the end of the NY SLA hearing, the attorney for Earl’s repeated previously-voiced threats that if they lost the hearing, the owner, Michael Cesari, will serve food-only in the backyards, 7 days a week. In our humble opinion, given the overwhelming consensus of the SLA agreeing with the majority of the rear-window-facing neighbors who objected to Cesari (or anyone else!) doing any business in the residential backyards, Cesari will be doing this out of spite, and his customers should know about it. re: revising the Application process for outdoor, sidewalk or rooftop bar & restaurant expansions. Community Board 11M’s Licensing & Permits Committee is in the midst of revising their application process for bars trying to open or expand into residential backyards & rooftops. They briefly discussed it at the last two meetings, & we are hoping to help them come up with new procedures ASAP, before any more blocks are disrupted by outdoor bars & restaurants that ruin the lives of those who live above & next to them. The new Chair has stated he is interested in the process but has not yet added the above to his agenda yet. Our suggestions are at least partially due to the ongoing noise & friction raised during our community’s battle to stop Earl’s Beer & Cheese from expanding into 3 adjacent backyards. Visit WWW.9798LexPark.com for the details on that issue. We hope to avoid a repeat situation, similar to the contentious fights over Earls, where our block association had to attend 4 NY SA hearings before prevailing, & we pray that the Chair starts this review as soon a possible. We are leaning very strongly to opposing all commercial & entertainment-type development in NYC residential backyards, with or without liquor, but in the interim, if these proposals are at least reviewed & taken into consideration and some are implemented, we are open to the CB’s serious revision of the process. Currently the CB11M L&P committee requires a semi-detailed application, as well as posting on the door of the bar & “200 feet” from the establishment only SEVEN DAYS ahead of the hearing, & require “circulated petitions of support”; these latter vague & short-date requirements giving neighbors virtually no notice to find out the hours, details of operation (i.e., HOW LOUD, HOW LARGE ARE THE NEW CROWDS), to show their support or opposition, etc. And in the past, even that minimum posting requirement has been ignored. Being grateful that the CB11M Licensing Committee has, on their own, suggested requiring more affected residents’ approval for future bar expansions, we have created a set of modest suggestions for how CB11M can revise their application process. We hope this could become a city-wide issue to help both renters & residential property owners stop the noise & the lessening of the quality of life outside their rear windows, & on their street-side of their blocks as well.